Launceston Bible Christian Church | Launceston Then! The Bible Christian Chapels in Tower Street. William Bryant was born the second son of a substantial yeoman who owned several farms in the coterminous parishes of Luxulyan, Lanivet, and Lanivery, on the 6th of February, 1778, at Gunwen in the parish of Luxulyan. His parents were staunch Methodist and were very pious. His maternal grandmother was a quakeress. From the first an extremely religious lad, O’Bryan was much impressed by the preaching of John Wesley, and studied his ‘Christian Pattern.’ Other favourite books were Law’s ‘Serious Call,’ Baxter’s ‘Saints’ Rest,’ and Bunyan’s ‘Holy War.’ On November 5th, 1795, at the age of 18, William joined the Wesleyan Church and at once began to exhort his friends and neighbours to turn to God. He soon became a self-appointed home missionary, and established Wesleyan Churches in Mawgan, St. Mabyn, St. Neot, St. Eval, and many other places. He married Catherine Cowlin on 9 July 1803; they had two sons and six daughters. 1815 proved to be a year of change for William, first, in wishing to adopt Irish ancestry, he changed his name to O’Bryan and secondly, with his irregular work as an evangelist, he was excluded from the Wesleyan Church. This however, did not prevent William in his evangelical crusade and he continued to preach his sermons to the parishes of North East Cornwall and North West Devon and the branch became known as “Bryanites”. On July 15th, 1815 he left his home in Luxulyan, and preached in several parishes around Launceston when on his way into Devon, On August 20th, on his return from Devon, he stopped to preach to a large concourse of people at Warbstow Burrow before returning to his home in Luxulyan. He did not tarry long at home, but set out almost immediately on another preaching tour. As he went he preached in farm kitchens, on village greens, by the roadside, and where ever a congregation could be gathered. On October 9th he reached Shebbear, Devon, and the same evening preached in the kitchen of Lake farmhouse. There, after the preaching service, the first Society of the People, afterwards called ‘Bible Christians’ was formed, consisting of 22 members. The work extended rapidly in the parishes around Launceston, and the first Bible Christian Conference was held in Badash farmhouse, Launceston (left), in 1819. It was commenced on August 17th, and closed on August 27th. William was president and James Thorpe secretary. The form of a deed securing chapels was read and adopted, and after a long discussion the decision to recognise females as itinerants was reached. The second conference was also held at Badash. At this conference part of the minutes offered this advice ‘take care of your health, rise early, spend much time in prayer, be sober in the midst of excitement, be diligent at all times, punctual in all things, strictly fair and impartial in the treatment of all persons, and especially tender and considerate to the fallen and erring.’ Nonconformity to the world in the matter of dress was strongly urged on all the members of denomination. O’Bryan left the society in 1831 over administrative differences and began an itinerant evangelism in the United States between 1831 and 1862 and crossed the Atlantic 13 times, preaching to North Americans, but failed to establish a church. His wife died at Brooklyn, where they had settled, in March, 1860 with William living to the ripe old age of 90 dying on January 8th, 1868 also in Brooklyn. Q.-Shall the Shebbear, Week St. Mary, and Brentor Circuit be divided? A.-Yes; and two additional stations formed out of them to be called the Launceston Circuit and Northlew Mission. There were 17 preaching places in the Launceston circuit, and the number of members was 275. The first ministers to to the circuit were James Barnden and Ann White. The first quarter’s receipts were £14 9s. 4d., which was sufficient to meet all expenses, and to leave a balance in hand of 14s. 11d. The first resolution passed by the new Wesleyan Quarterly Meeting is of interest, because it adds to the information given in the minutes of 1841 as to the circuits out of which the Launceston Circuit was formed. It reads’ ‘ That the District Meeting and Conference be requested to place this Circuit on the list of missions for the coming years, as it is composed of small societies taken from the Week St. Mary, Brentor, St. Neot, and Holsworthy Circuit, and is very dificient in the chapel accommodation, especially in Launceston. We think, can it receive assistance for a time, it will become a circuit of importance to the Connexion.’ The Conference had such confidence in the Launceston people that the circuit was not made a mission, and it received no grant. For many years the Society at Broadwood was the leading society in the Circuit. It was, however, closely followed in influence and strength by the societies at Congdon Shop, South Petherwin, and North Petherwin. In 1841 there was a small society in Launceston, consisting of eleven members, with two on trial for membership, but without a suitable meeting place. In 1843 Launceston itself was omitted from the list of preaching places without note or comment. Four years later it reappeared on the list without note or comment, except that it is recorded that there were then three members of the society in Launceston. The Tower Street Chapel was built in 1850, at the cost of £750. Parties: 1) William Pearse, surgeon, of 1 Flora Place, Union Road, Plymouth 2) Henry Bullen, mason, of Lifton, Devon; John Ellis, shoemaker, of Stowford, Devon; Henry Pethick, labourer, of St Stephen by Launceston; William Downing, labourer, of St Stephen by Launceston; John Reed the younger, yeoman, of Lewannick; William Halloway, shoemaker, of St Giles in the Heath; Arthur Peter, yeoman, of Lewannick; Samuel Sandercock, labourer, of Launceston; Peter Facey, yeoman, of Lifton, Devon; William Prout, yeoman, of Werrington and John Tubb, yeoman, of St Giles in the Heath, all trustees. Conveyance from 1) to 2) of a walled garden and pleasure house, previously a waste spot of land on which was formerly situated a dwelling house and garden, in Back Lane (Tower Street), Launceston, formerly occupied by John Webb, then John Tyeth, then John Dymond, then John King Lethbridge, then Thomas Ching, deceased, then Samuel Rowles Pattison and lately of 1). To be held to the use of 2) upon trust that they will build on it a chapel for use by the people called Bible Christians. Consideration: £105. Witnesses: George Batt, Matthew Robins, Richard Kinsman, Harriet Sanders and George Symons, clerk to Messrs Pattison and White, Launceston. Endorsed: ‘No 23’ and enrolment in the High Court of Chancery 2 June 1851. With an increasing congregation a larger chapel was constructed in 1897, alongside the original whitch then became the Sunday School. From 1850 onwards the membership in the Circuit began to grow with a membership of 604 in 1891 for the whole Circuit. By 1906 the Circuit included 14 chapesl, 14 Sunday school buildings, three caretaker’s cottages and two minister’s houses. 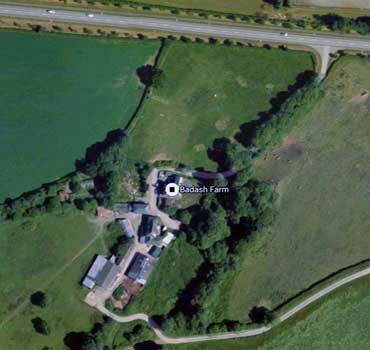 The total debt, excluding the debt of £608 on the minister’s houses, stood at £1,365, with the properties value, again excluding the minister’s houses, standing at more than £10,000. Tower Street Chapel 1952 Sunday School Anniversary. Back row ?, Lionel Pooley, ? Mr. Mules, ?, ?, Mr. Meddleton, ?. Second row: first four unknown, Mrs. Williams, Molly Daniel, Mrs. C. Greenaway, Mrs. Cullington, Mr. Gillbard, Mrs. Oatey, ?. Third row: Mrs. Davey, next three unknown, Phyllis Gimblett, ?, ?, Brian Robins, Melvin Plumb, Roy Cole, Percy Broad, Christopher Davey, Ronald Screech. Fourth row: ?, Jennifer Mounce, next three unknown, Margaret Petherick, ? Ruse, Christine Ewen, ?, Jacqueline Greenaway, ? Stanmore, Dr. Ewart Cole, John Gillbard, Malcolm Fry, Keith Dymond, Adrian Hicks, next three unknown, David Blatchford, ?. Fifth row: Len jones, Gladys Davey, Mary Parish, Margaret Penwarden, ?, Marjorie Broad, Betty Screech, ?, Elizabeth Dymond, next three unknown, Mrs. Dinner, Mrs. Blatchford, ?, Rev. ?, Mr. Davey (seated), ?. Seventh row: first eight unknown, Derek Cole, ?. Front row: first two unknown, Roger Cullington, next four unknown, Alison Fry, next nine unknown, Pamela Blatchford, Monica Senior, ?. 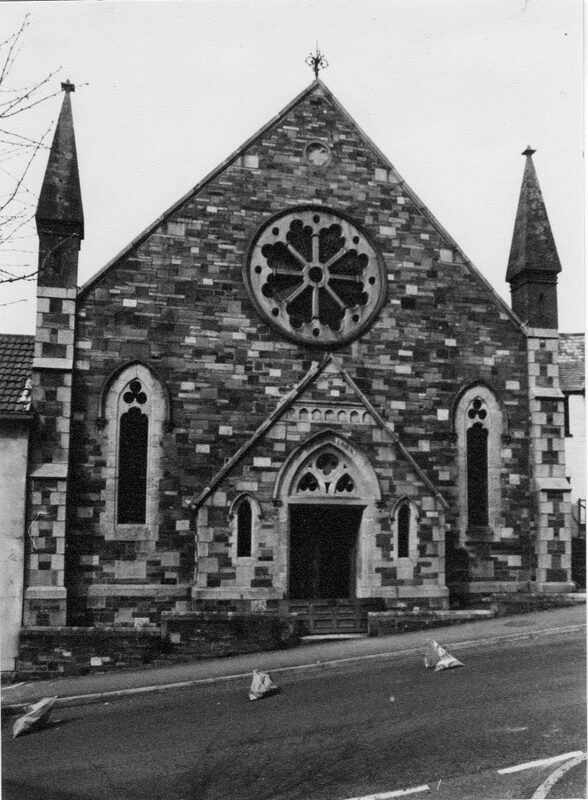 In 1974, after a gradual decline in membership, the Bible Christian’s agreed to amalgamate with the Wesleyan Chapel and both buildings were sold off. The Tower Street Chapel was demolished in 1982. Unions and amalgamations of this and other groups formed the Methodist Church as we know it today with the circuit being known as Launceston Central.